Explainer: How Do the Kurds Relate to the Arab World, Palestine, and Israel? On September 25th, Iraqi Kurds voted overwhelmingly in an independence referendum to separate from Iraq and become an independent state. Immediately thereafter, the Iraqi government called for the result of the vote to be annulled and began to isolate the region. In the subsequent month following the vote, Iraqi military forces took back a large portion of land (one-fifth) under Kurdish control, including important oil fields. The Kurds had taken advantage of Iraq’s involvement in war against the Islamic State and a breakdown of government in Syria in 2014 to take control of land historically claimed by Iraqi Kurds. Since the establishment of the new Iraqi constitution in 2005, the borders of the Kurdish autonomous region have still not been agreed upon. The US, for its part, criticized this referendum based on its timing and implementation in contested zones. Next year there is a general election in Iraq. The Trump Administration fears that political conflict stemming from Kurdish Independence would weaken the Prime Minister, Haider al-Abadi, as he tries to hold the government together as it battles the Islamic State. It also pushed citizens in large cities like Kirkuk to decide where their loyalties lay when the KRG border has still not been legally defined. This, US diplomats say, invites unnecessary conflict. The Kurdish people are an ethnic group with ruling dynasties dating back to the 10th century. This nation speaks Kurdish—a language originating from Western Iranian languages that descend from Old Persian and Median of the 6th Century BCE. There are three significant factors that typically determine the Arab identity and representation. These are language, genealogy, and culture. Arabs speak Arabic (whatever dialect it may be), a Semitic language developed in the 1st century, later than Kurdish roots. Communities that can tie their lineage to tribes originating in Arabia—or the Arabian Peninsula—are inherently Arab. Genealogically (or ancestrally), Kurds come from Iran, which is distinct from the Arabian Peninsula. Of the three fronts, Kurds are most similar to Arabs in their culture, because they cohabitated for hundreds of years under Ottoman rule. However some distinctions can be made, in that unlike most neighbouring Muslim cultures, Kurd women do not cover their faces—and men and women participate in more mixed-gender activities. Most Kurds are Sunni Muslims like the larger Arab world. Kurds are the fourth largest ethnic group in the Middle East, following the Arabs, Turks, and Persians. They are also the largest stateless nation in the world with over 25 million people, mainly living in four states: Turkey, Iraq, Iran, and Syria. Kurds have the most political sovereignty in Iraq, making up a proto-state in northern Iraq with an autonomous rule under the current Iraqi Constitution. The Iraqi Kurds have been able to build a parliament, education system, and the necessary infrastructure for a move to independence. They have also remained un-attracted to religious extremism and terrorist organizations that exploit hate for Western imperialism in the Middle East. Rather, Kurdish militias have led the resistance to the Islamic State, and the world owes the Kurds a debt of gratitude for their sacrifice. Up until World War I, most Kurds lived among neighbouring Muslim populations within the colossal Ottoman Empire. As the empire slowly collapsed over a century, secular Western states hoped to dominate parts of the Middle East for rather transparent political and economic ends. Originally, the defeated Central Powers signed the Treaty of Sevres in August 1920 that would partition the Ottoman Empire into a number of smaller states. Various portions of the former empire were carved out for direct control of Allied Powers, such as the Kingdom of Iraq under British Administration (Mandatory Iraq), and the French Mandate for Syria and Lebanon. In this treaty, the Kurds were recognized as deserving a small state for themselves and would hold a referendum to decide the frontiers of Turkish Kurdistan. Even at this time, the Kurds would be divided, as large populations inhabited the new French and British mandates. Once the War of Turkish Independence broke out, however, the treaty was dropped and eventually replaced by the Treaty of Lausanne in 1923 that made no indication of the Kurdish nation. Following the official division of states and the growing ethnic nationalisms that ensued during the partition of the Ottoman Empire, Kurds were systematically denied political representation. Over a dozen Kurdish rebellions took place in the 20th century in Turkey, Iraq, Iran, and Syria, as the Kurds attempted to preserve their culture and language under repressive regimes. In Turkey for instance, all acknowledgement of the Kurds was banned in the public sphere, and they were referred to officially as “Mountain Turks.” Their language was prohibited, and no school can teach the Kurdish language to this day. In 1962, nearly 20% of the Kurdish population in Syria lost their state identification cards and were exiled as illegal immigrants. In Iraq and Syria, following the development of the Ba’ath Party (originally an Arab nationalist and socialist political movement to unify the Arab world into one state), Arabization programs were implemented for nearly three decades that minimized Kurdish culture and language, isolating Kurdish settlements. Many nations of the Arab world view Kurds as foreign and unwanted disrupters of the state’s governance. They have been labelled as hotbeds for terrorist groups, such as the Kurdistan Workers’ Party (PKK), that seek to hinder the state and topple legitimate governments. In reality, both sides—Kurdish rebels and government forces—have committed war crimes, as the Kurds fight for equal representation and the protection of their minority ethnic group. In Turkey, Syria, and Iran, Kurdish parties are marginalized and most are banned from participating in any form of democratic political representation. 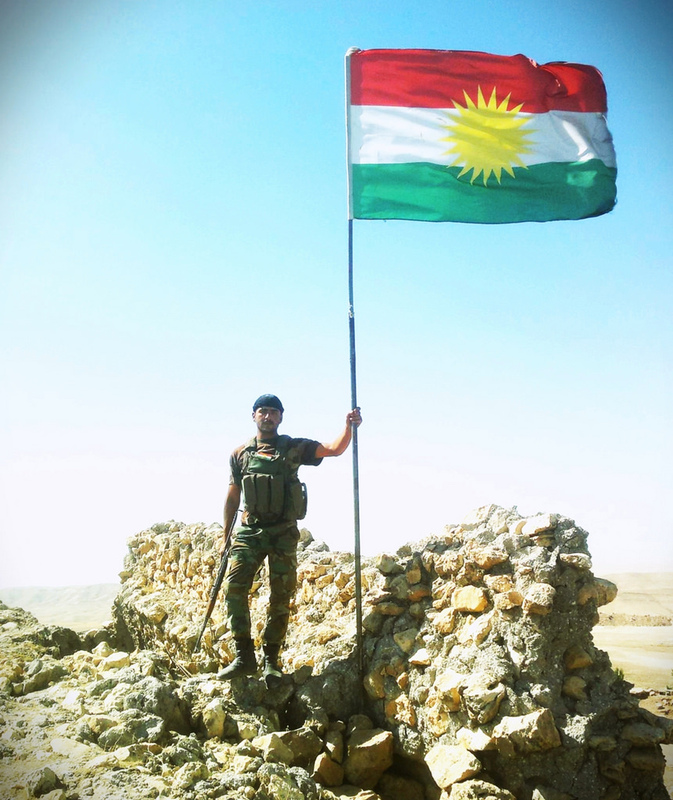 Hence, Iraqi Kurdistan provides the strongest front and best hope for a future Kurdish state. In the eyes of Israel, the Kurds are another minority non-Arab nation in the Middle East much like themselves and have supported them as such. There are also over 150,000 ancestral Kurdish Jews in Israel, which allows the two sides to cultivate a mutual respect and understanding. However, Israel has not always supported the Kurds. In the 1980s, Palestinians and Kurds came together for military training operations conducted in Lebanon through the Palestinian Liberation Organization (PLO) and the PKK. In that era, Turkey and Israel denounced their respective minority enemies as guerilla terrorist forces attempting to kill civilians and overthrow the rightful state. Recently, however, Turkey has criticized Israel’s treatment of Palestinians, creating tension and hostility between the two states. Thus, the Israeli government has no diplomatic conflict in calling on the Kurds as a wronged minority group, putting pressure on Turkey’s leadership. Most of the rest of the world disagrees with Israel and sees the Kurdish referendum for independence as an unnecessary and destabilizing move in geopolitics. Palestinian political leaders have come out against the referendum, stating that the Kurds should seek political representation within existing states, to aim for political “freedom, but within the framework of unity.” The Palestinian dissent likely only comes with such vigour due to Israeli encouragement of the Kurdish independent referendum. Many have couched a Kurdish sovereign state in terms of a “second Israel” in the Middle East—an imperialist political movement whose mission is to exploit the Arab people. However, according to a former minister Ghassan Khatibi, on the ground, the average Palestinian has sympathy for the Kurdish cause. Palestinians see themselves alike, as a minority nation subdued without political sovereignty within a state dominated by ethnic rivals. There is a level of dissonance in the ideological argument that Palestinians deserve their own state—as a nation pushed aside and repressed by Israelis, backed by Western states breaking international law—but Kurds do not. Palestine was a geopolitical entity carved out of Southern Syria, administered by the British following the fall of the Ottomans in World War I. The French and British mandates, as well as the new Turkish state, were also entities providing foreign administration that did not respect the presence and rights of the Kurdish nation. Without reducing or conflating the two distinct historical conflicts, it is worth noting that both nations were subsumed within states, with changing demographics and foreign political governance that diluted their political power. 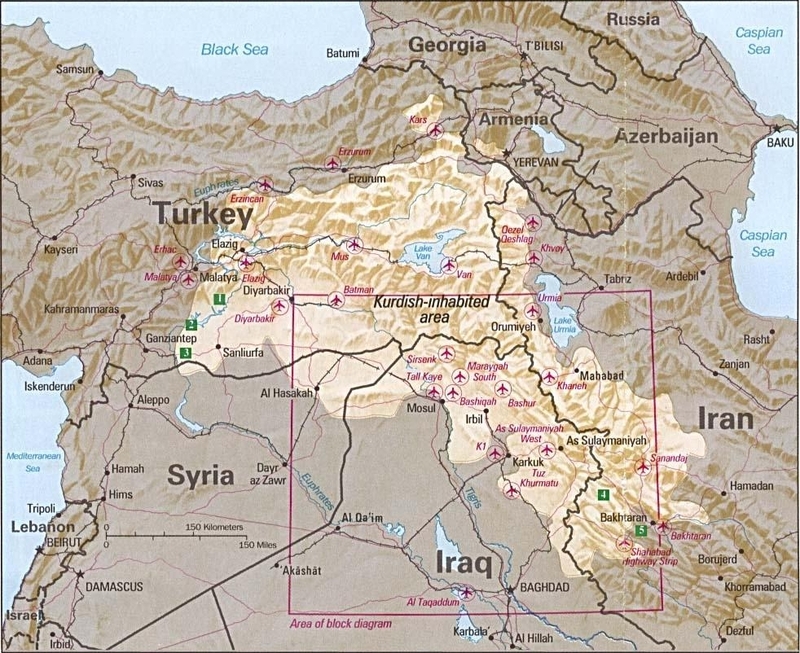 The Kurdish nation demographically looks like a gerrymandered map of districts in an American state, with 25 million people split into four distinct and legitimate states, conveniently forming minorities in each one. The Palestinians lost some representational power through the immigration of large numbers of Jews to the area and the creation and expansion of the Israeli state following wars with Arab countries. While Palestinians had Arab allies to support their claims of historical right to political sovereignty, Arab nations of the Middle East looked the other way while the Kurds fought for their right to representation. In no way do these circumstances invalidate the goals nor the long, costly campaign for Palestinians’ right to self-determination. Rather, the facts outlined here point to a broader ideological struggle of justification based on ancestral origin. Couching the argument in terms of ethnic group—the Jewish diaspora to Jerusalem, the Palestinians to their contemporaneous homeland, and the governments of Turkey, Iran, Syria, and Iraq to their ancestral lands—does not resolve societal conflicts of identity and representation, nor does it provide moral superiority in battles for sovereign nation-states. The underlying reality is that no nation or ethnic group gets a fair shake in geopolitics and state building. Western powers following World War I, and for decades after, dictated whose claim to what land was valid, based simply on European power politics and military might. Modern states founded on the sanctity of ethnic homogeneity are not likely to see future peaceful coexistence with neighbouring powers, immigrant populations, and minority groups fighting for equal representation. 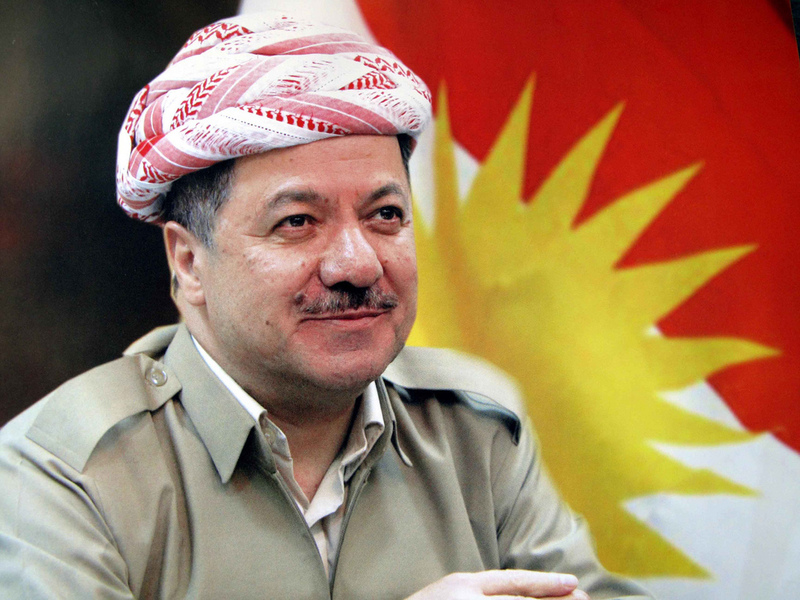 Might the formation of a Kurdish state reduce conflict between Kurds and Arabs writ large? Probably. Would all states involved lose national income and the ability to develop stronger economies for their citizens? Most definitely. Do Arab governments have any incentive to relinquish control over land, resources, and citizens? No. Here the larger crisis comes to a head. Leaders of current states need to accept and recognize claims to equal representation of minority groups and the plight they have faced. Governments and their citizens must accept the demographic realities of their countries and move forward with the political integration of ethnic minorities. Expressing arguments of sovereignty and political justification in ethnic or racial ancestral terms only provides another weak point in the foundation of modern nations for a fissure to crack open and swallow the country up. Similarly, if Israelis do not accept Palestinians as equals and accord proportional representation in governing the state, Israel will face continued violent conflict and the diminishing of its strength through international isolation, or the forced implementation of the two-state solution. As for the promotion of a two-state solution to the Israel-Palestine conflict, a double standard is set when the Kurds are not due the same right and privilege.